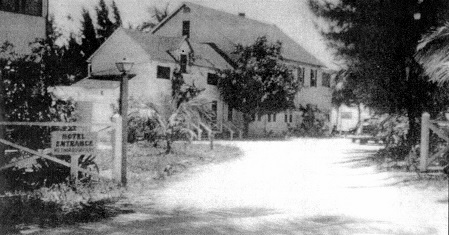 In 1912 the first hotel on Estero Island was built at the end of Pompano Street. At this time, the island was only accessible by boat. The guests would arrive by schooner and would dock at a pier on the gulf side in front of the hotel. The original pier was destroyed by a hurricane in 1926 but was rebuilt in 1930. In 1944, another hurricane wiped out the pier, which was not rebuilt. The pilings from this pier are still visible today. The bridge was built in 1921 which made it possible to drive to the island. In 1936, the hotel name was changed from the Winkler Hotel to the Beach Hotel and the resort became a popular destination for the rich and famous. The hotel was sold in 1975 and a condo was built in its place.